Cabrini College pulled together the efforts of students, faculty and the college’s food service provider, Sodexo, to donate 1,289 pounds of food to the emergency food cupboard Nov. 20 at Catholic Social Services’ Montgomery County Family Services Center in Norristown. 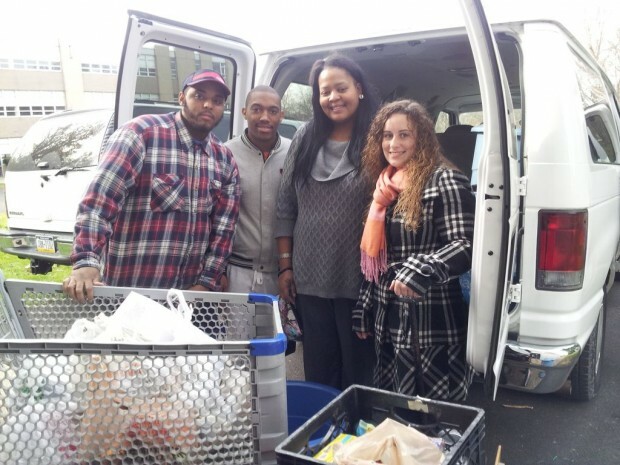 From left, Cabrini students and staff Frank, John, Mecca and Caitlin drop off Thanksgiving turkey dinners that the Cabrini College community collected. Cabrini College and Catholic Social Services helped make festive Thanksgiving feasts for 280 families in Montgomery County by donating 1,289 pounds of turkeys and all the trimmings – including fresh produce and baked goods – to CSS’ emergency food cupboard in Norristown Nov. 20. The donation comes in addition to the more than 3,000 pounds of food given to 500 different families each week at the cupboard, according to Elizabeth Peteraf, program manager of the CSS Family Services Center for Montgomery County, which operates the food cupboard. Donations primarily come from individuals in the community, plus members of local parishes including St. Titus in Norristown and St. Genevieve in Flourtown, with additional donations from Philabundance and the county government. The food donations not only brighten the spirits of families for the Thanksgiving holiday, they especially help families stretch tight budgets. Through the cupboard, families can also get personal care items like toothpaste, soap and shampoo “which they can’t get with food stamps” plus special foods for people on restrictive diets such as diabetics, Peteraf said. Although the outpouring of generosity at this time of year is needed and welcomed, Peteraf indicated the need is there year-round. It is especially acute during September and October, when “we really struggle to keep the shelves (of the cupboard) filled,” she said. She suggested that parishes and individuals “plan to have a food drive at the end of summer or just after school starts” to replenish the cupboard’s supplies. She emphasized the need for high-quality foods, including protein-rich peanut butter, whole-grain pasta and rice, nutritious soups and 100 percent juices. To help in the year-round effort to feed hungry families and individuals in Montgomery County, contact the CSS Family Service Center at 610-279-7372. Visit the web site of Catholic Social Services to learn about the full range of the agency’s programs, or visit the site of Nutritional Development Services for information on how the Archdiocese of Philadelphia helps people from all walks of life obtain nutritious foods. NEXT: New website promotes Catholic adoptions in Pa.